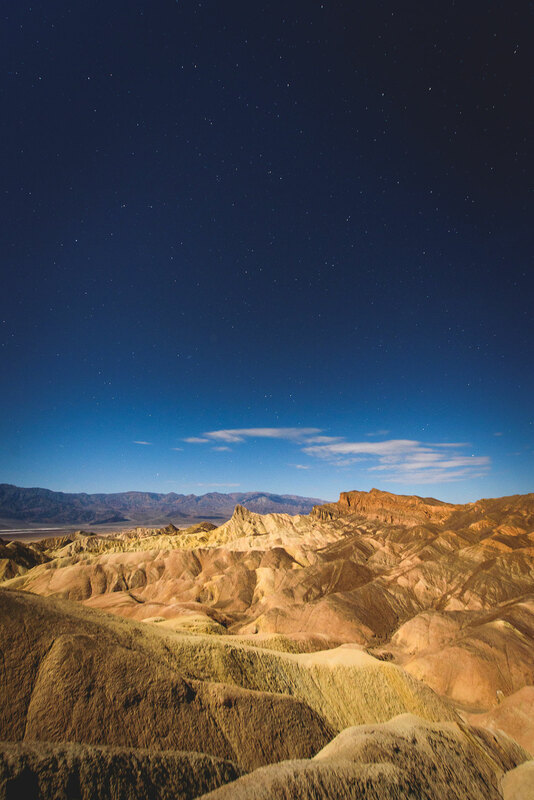 Best described as unbearably beautiful, Death Valley’s natural personality is also palpably Borderline. Long lonely silences, blinding dust, and salt that cloys the skin meets convection oven heat that sets itself to broil come 10am. It’s an otherworldly terrain that deals primarily in extremes and there is very little the Valley cannot contrive to actively discourage outsiders from daring to enter. But for those who persevere the rewards are just as intense. Vivid blue skies turn into apocalyptic purple sunsets as the clouds reflect the minerals from the earth, while mudstone hills threaded with layers of colemanite and ulexite create creamy Neapolitan shades so delicious you’ll want to lick them. It’s Mother Nature stripped back to her barest essentials, where those intrepid enough to handle her at her worst are gifted with her very best. It takes more than 450 kilometres to get close to the park from Los Angeles, with every kilometre blowing off the dynamic pressure of that sparkling city. Whereas the stop-start flow of inner-city gridlock says volumes about the realities of urban life, true ‘rush hour’ is actually found along the CA-127 when the highway looms uninterrupted into the horizon and you realise there’s nothing more exhilarating and hopeful than the open road. Fields of wind turbines flank your sides, calmly whirling in unison as they take an element as unpredictable as the wind and funnel it into something quantifiable and consumable. Worn powerlines dip and yarn in rhythm with your speed; the deeper into the desert you drive the more brittle and fragile their connections appear. These are seemingly the last physical reminders of the metropolis just hours away. Shopping malls are left behind, along with giant billboards shouting unrequested aspirations into your psyche. They know their audience isn’t going to be found among the basin of the Amargosa Range, which is precisely why you’d come here. Only upon entering Death Valley Junction can the reality that each settlement here exists in its own universe be truly comprehended. Every creature that resides in the valley bends and shifts with the will of the Mojave Desert and humans are no exception. The bartender at the Corkscrew Saloon, a mock-pioneer era safe house in the man-made oasis of Furnace Creek, will probably offer a comforting paper napkin to blow your nose when it becomes congested from the grit. “I had to take three days off before I even started work here because my body rejected the whole place. It happens to everyone,” he says. Turns out that at nearly 60 metres below sea level, an acclimatisation period is unavoidable. Of course, it is the nature of mankind to always push forward through adversity and the inhabitants of the miniature townships that dot the Death Valley map are the best examples of willpower over wisdom. Reading your mind, he’ll likely point through a clean space in an earth-varnished window. The reason for the sweat, struggle and stinging eyes playing out in slow motion across the 8pm sky, silent but screaming with joyous colour as flosses of clouds lined with purple meet the burnt orange ranges. This is what it feels like to be struck silent – to be humbled by nature, lacking the words to reply to such a symphony. Music being the closest language we have to match the emotions that come from standing still in the desert and watching our planet play out its routine regardless of politics, wealth or culture. 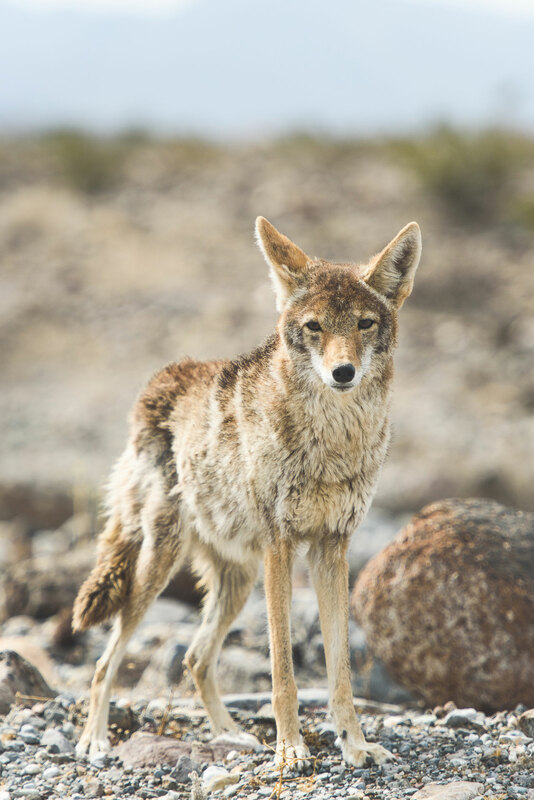 But Death Valley’s song is silence until it all eventually fades to black and the chorus gets handed over to the coyotes. Opportunities to explore Death Valley are time sensitive. It’s designed to be viewed briefly and with respect to her constantly shifting moods. The Devils Golf Course in Badwater Basin seduces with its halite salt crystal formations but plays havoc with your lungs if you linger too long. 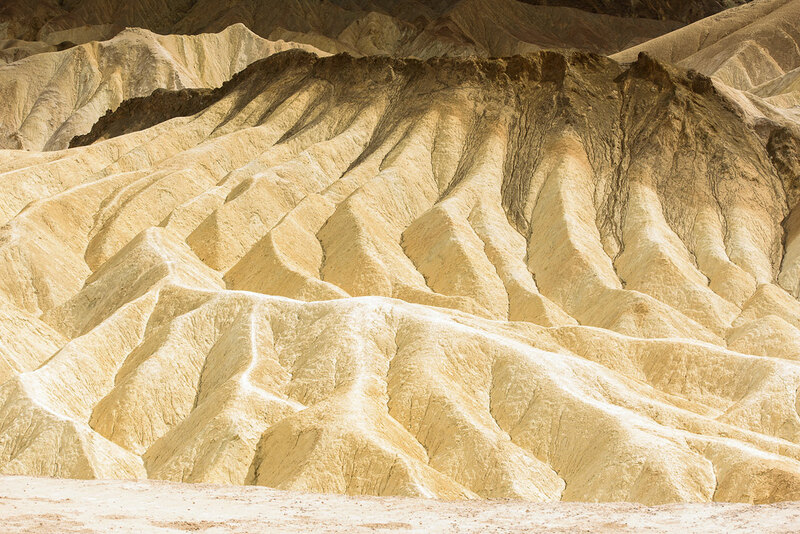 The convoluted dunes around Zabriskie Point, with its funnels of golden sediments, seem soft and approachable at 3am until sunrise and past 4pm until nightfall. However, those waves can quickly become a prison come high noon. 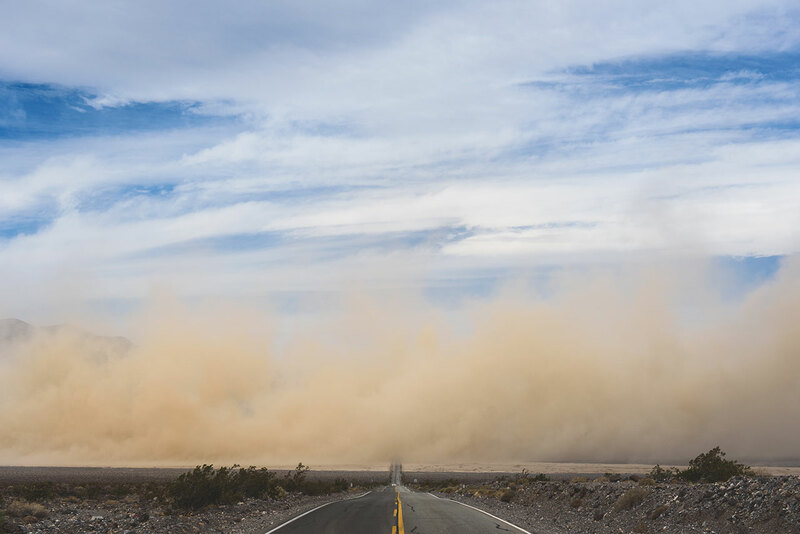 There are many stories of travellers confused by the heat walking determinedly into the wrong direction, away from their cars and giving themselves completely to the desert. The entire park is made up of hundreds of these juxtapositions of risk versus resplendence. The landscape always provides lessons in pushing and appreciating your limits, like the tough love of a tutor impassively watching you make multiple mistakes until common sense prevails. 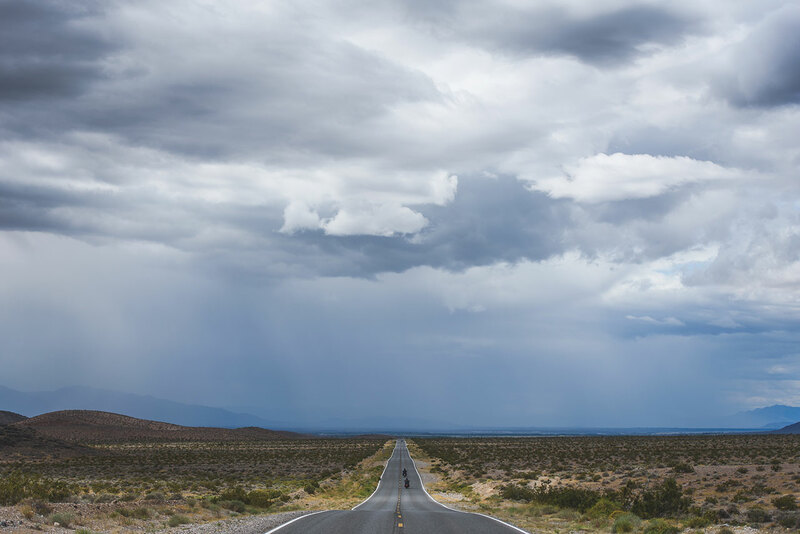 The highway stretches interminably, offering a way out, a route back to the soft life, but also, through the rear-view mirror, a means to return to the rawness of nature and its harsh lessons of survival against the odds. The Inn At Furnace Creek sits elevated above Badwater Basin, and acts as the foil to Death Valley’s largely barren landscapes, offering luxury resort accommodations and fine dining, served up with sweeping picture-window views across the Greenwater Range.